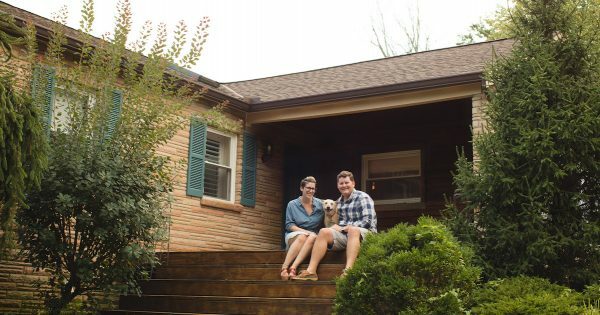 In this series, NerdWallet interviews new homeowners across the country about their unique homebuying journeys and the financial decisions that helped them get there. In May 2016, Nelson and Chelsea Mead bought their first home in Cincinnati, Ohio. What brought you to Cincinnati? I went to Miami University on the outskirts of Cincinnati, graduating in 2011. Chelsea went to school in Cleveland. We moved to Cincinnati together when I got a job here and got engaged in 2012. Chelsea owns her own business and can work from anywhere. Why did you decide to buy a home in Cincinnati? We rented in three or four different neighborhoods over the course of a couple of years. When I got a more stable position — the one that I’m currently in — we decided to buy. I was tired of renting, which felt like throwing away equity every month. I knew that if we wanted a bigger place, a mortgage payment would be about the same as a rental payment. We wouldn’t have to deal with the hassles of a landlord or maintenance person and could take care of things on our own. Our budget was $215,000. We wanted something relatively close to the city. We have some friends outside the city and felt that was too far. We wanted a good school district since we planned on beginning a family at some point. Now we have our first son, Avery, who is almost 5 months old. It took us two months to find our home. I was surprised by how quickly homes sold for in this city. Growing up in other parts of Ohio, I saw that it took most homes several months to get an offer. In Cincinnati, homes would sell the day of, or within the week. We put an offer on one home that didn’t pan out; it sold for above asking price. Two months in, we found our home. I wanted to be very involved with the negotiation process. We were able to find leverageable items within the home inspection to lower the price. We started at $210,000 and lowered it to $195,000. It checked all of the boxes. It’s a ranch situated on one acre of woods with a small yard, three bedrooms, two bathrooms and a large patio in the back. We wanted something turnkey, and it had recently been renovated with all new appliances. That was a big factor for us, as we didn’t really want big maintenance costs right off the bat. It was in a good school district with accolades. My wife and I both grew up going to the same school as our neighbors, so we also were hoping to raise a family that way. Anderson Township, our neighborhood, has a lot of community involvement: concerts on the plaza, parades during the summer, etc. I’m a finance guy by trade and character, so I’m definitely a researcher, whether it’s looking for the best ceiling fan or looking for a house. I spend a ton of time looking at reviews and options. My wife is more artistic and flies by the seat of her pants. She’s not a huge spender but is more impulsive with purchases. I used to work in the mortgage industry, which helped me know what type of mortgage I wanted. I saved for a while so that we could go with a conventional mortgage with a 20% down payment to avoid a mortgage insurance premium. We set up a separate bank account and squirreled away a bit every month. We try to live on the same budget every month, regardless of whether we get a big commission check that month or not. We think of our income as meeting our needs and put away any extra. Our parents also helped us out a little bit to meet the down payment. The biggest challenge was trying to find time to go view houses and being able to decide that we liked one enough to make an offer on the same day. That was the housing market in Cincinnati at the time. What advice would you give to someone considering moving to Cincinnati? Get a real estate agent who has a successful history in the area where you’re looking. There are a lot of different neighborhoods and factors that determine the worth of the house. In Cincinnati, you can have a million-dollar home next to government-subsidized housing. Another big thing is making sure the home won’t need any major repairs. Amy Broghamer, the Meads’ real estate agent, says these are the top things first-time home buyers in the Cincinnati area should know. Be prepared to write multiple offers. The market is extremely competitive; Broghamer says that she prepares her first-time buyer clients to make three to five offers. “They usually don’t get the first house,” she says. Pick the right neighborhood. Broghamer notes that downtown Cincinnati, as well as Northside and Walnut Hills, are very popular among first-time buyers. She adds that Oakley is a tried-and-true, stable market for young professionals. No matter what your savings goal is — a new business, a house, a wedding or big trip — NerdWallet can get you there faster. Sign up for free to see how.